My hometown of Maldon in Essex, England is very special to me. I grew up here among the wonderful old Thames barges and other watercraft on the mouth of the Blackwater River. 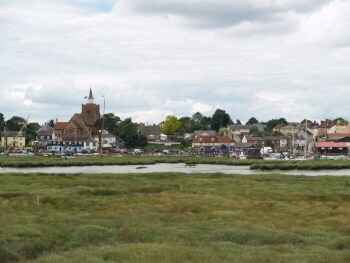 The town is also famous for Maldon salt and the annual Mud Race, both of which attract international attention. Maldon boasts some lovely old buildings, including St. Mary's church which sits by the Hythe area, which itself has become home to a close community of people with interests in sailing and numerous forms of creativity. 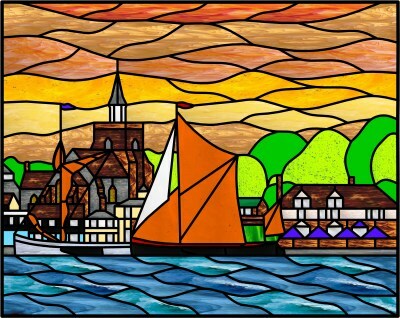 The other community hub of the waterside is the Queen's Head pub which is where I exhibit my stained glass panels and windows in the town's yearly art trail. This year, I decided to incorporate all these elements into my main exhibition piece and Maldon Sunset is this panel. My first step was to spend some time looking around the Hythe, specifically to remind myself of the visual interplay between the church, water, barges, pub and the reflective light which can make the area "shine" on occasion. I then took this imagery back to my studio to create a picture that would include all the aspects of the area as described above. After I was happy with my representation, I used Glass Eye 2000 to transpose my picture into a stained glass format which would represent the feel of the scene and began cutting the first of the 268 pieces which were to make up the panel. The photograph above shows all of the glass pieces cut out and in place. 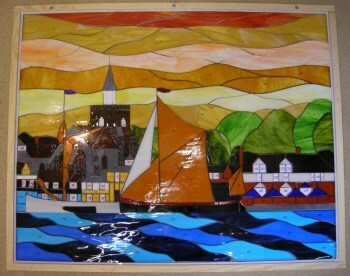 I chose glass that would best represent the light and textures of the scene. I used the copper foil technique. This was a particularly delicate task with the tiny pieces to ensure they lost none of their impact. I then soldered the pieces, again paying special attention to the smallest parts. 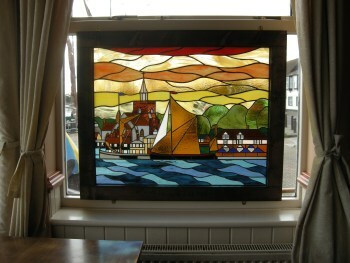 My completed panel was framed and exhibited by being set in the most appropriate window of the Queen's Head pub where it looks out onto the quay. 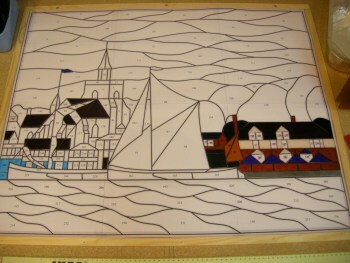 Parts of the scene represented in the panel can be seen either side of it with the furled sails of one of the barges to the left and part of a weather boarded building to the right. Ian was born and brought up in Maldon Essex England, where he continues to live. 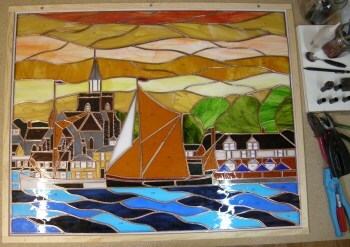 He has been producing stained glass art since 1983 and more recently has worked full time in this field. While he is perhaps best known for his maritime work and his Rennie Mackintosh inspired pieces, he also creates in a number of other styles, both abstract and figurative. 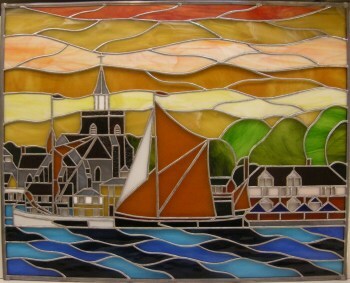 He primarily employs lead light and copper foil/tiffany style techniques to create windows, panels and three-dimensional pieces. You can see more of Ian's work at his website, or you can contact him by email.